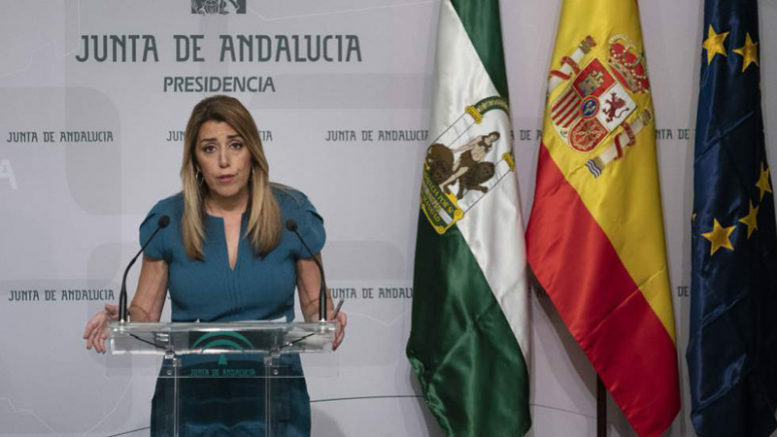 Andalucian President Susana Díaz announced Monday that Spain’s southernmost region will hold early elections the first week of December, moving forward the regularly scheduled regional balloting by three months in a move that effectively kicks off a round of important 2019 municipal, regional and European parliament elections across Spain. The announcement by Díaz, whose own Partido Socialista Obrero Español de Andalucía (Spanish Socialist Workers’ Party of Andalusia, or PSOE-A) is the largest regional affiliate of the national Socialist party (PSOE), represents an important first test of the PSOE’s strength since Spain’s new Socialist President Pedro Sánchez came to power in June. The call for early elections in Andalucia has been seen as imminent for weeks, following withdrawal of support for the Díaz government by the centre-right Ciudadanos party, which left the PSOE-A governing with a 47-seat minority of 109 seats in the Andalucian regional assembly, eight seats short of the number needed for majority rule and approval of the regional fiscal budget early next year. Díaz has called the snap election for 3rd December, when her PSOE-A party will be challenged by the regional affiliate of Podemos from the political left and by a right-wing divided between supporters of Ciudadanos and the conservative Partido Popular (PP), traditionally the second-ranked party in Andalucia. While seen as a test for the Socialists, the upcoming electoral contest will also show whether or not the PP can resist the further advance of Ciudadanos in the region and will set the stage for a nationwide battle within Spain’s right-wing parties in the upcoming 2019 municipal, regional and European parliament elections across Spain. According to some observers, a strong showing by the Andalucian Socialists in December could tempt President Sánchez to seize the moment and call snap elections for renewal of Spain’s national Congress of Deputies, where the Socialists are governing in a minority position. Since coming to power in June through a no-confidence vote against former President Mariano Rajoy of the PP, the Sánchez government has clung to power with just 84 parliamentary seats of a total of 350 in Congress, having to maneuver and endure tough negotiations with allies and political opponents at every step of the way in its efforts to roll back Rajoy-era legislation and move its progressive agenda through Congress. Sánchez has repeatedly said that he intends for his government to endure to the end of the current legislative session in 2020, but widespread speculation is that a strong showing by the PSOE-A in Andalucia could cause a change of heart and lead to early national elections next year.